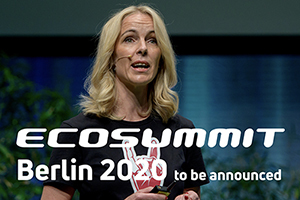 10 year anniversary - Ecosummit Berlin takes place on 15-16 May 2019 at Radialsystem. Come and join us. Ecosummit Ventures (pitch deck) will be a new smart green VC in Berlin that invests in promising European software and hardware startups with B2C and B2B business models in energy, mobility and cities. Ecosummit Ventures leverages the deal flow, investor network and track record of 19 Ecosummit conferences in 5 countries since 2010. The initiator of Ecosummit Ventures is Jan Michael Hess, the founder of Ecosummit. We’re looking for 2 GPs with VC track record and green heart beat to join as co-founders as soon as possible. Your deal flow is on YouTube. We are presenting the best smart green startups on Ecosummit TV in energy, mobility and cities that pitched at Ecosummit in the past. Our unique list features 36 companies: Blixt, First Light Fusion, Sono Motors, Sonnen, Thermondo, Climeon, Tado, Lilium, BlaBlaCar, Cityscoot, Vulog, Forsee Power, Sigfox, Netatmo, Kiwigrid, Origami Energy, Exeger, Mobisol, Solarkiosk, Sunna Design, Moixa, Greenergetic, Lumenaza, Limejump, DEPsys, ENIT Systems, Envelio, Ubitricity, Clevershuttle, Sunfire, Sol Voltaics, Skeleton Technologies, Cosmo Tech, Agrilution, Airlabs and Ekwateur. These startups represent exciting business opportunities for buyers and sellers as well as investment opportunities for (C)VCs and family offices. All of them work hard to create big impact and many of them have the potential to become big startups or even smart green unicorns. Pitch at Ecosummit Berlin 15-16 May 2019 to tell your startup growth story and increase the quantity and quality of the term sheets in your next financing round. Their president rocks, the market is huge, the startups are hot, investors go crazy and Paris is the place to be. The more we know about it, the more we love the French innovation factory and ecosystem. It has all the ingredients that are necessary to develop big startups with the help of awesome technology and superior business skills. Paris hosts a lot of VCs and corporates that invest in smart green startups. Above all, the outstanding experience and ambition of the French entrepreneurs make the difference. And now the capital has Station F, a beautiful and inspiring startup campus that was created by the telco billionaire Xavier Niel who is also an investor in Breakthrough Energy Ventures. It is about time that we take a deep dive into smart green France and launch Ecosummit Paris on 6 March 2018 at Bpifrance Le Hub. With the help of our sponsors and local friends we put together an exciting agenda presenting the crème de la crème in smart green energy, mobility and cities. It is our common goal to build big startups that have big impact. Co-investing strengthens the investor syndicate and enables startups to grow faster. Following this goal, Amsterdam-based SET Ventures announces their new investment in Limejump at Ecosummit London. ECO17 London took place last week at the magnificent LSO St Luke’s, attracted 140 participants and presented 38 startups, most of them actively fundraising. In fact, SET Ventures transfers another €3M to Limejump doubling their Series A which was led by Statkraft Ventures in July. This is the first co-investment of SET Ventures and Statkraft Ventures but it may not be their last one given that they have the same investment strategy and different competences and networks. 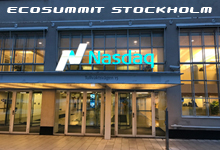 We are very happy to launch Ecosummit in beautiful Stockholm next week at Nasdaq. Having already produced unicorns like Spotify, Skype or King, the smart green city likes to call itself the “capital of Scandinavia.” This is rather a symbol of business than political ambition as Mayor Karin Wanngård will explain during her welcome speech about the future of Stockholm and their strategy for attracting all kinds of technology startups, investors and corporates. To help you discover new investment and business opportunities, Ecosummit Stockholm showcases 31 local and 12 foreign startups from Finland, Denmark, Norway, Latvia, UK, Netherlands, Belgium and Germany. An energy IoT platform startup was missing in their portfolio. Today, Rene Savelsberg shares again good news at Ecosummit Amsterdam 2017 and announces SET Ventures‘ new investment in Greencom Networks. The German software startup provides an energy IoT platform for utilities and OEMs to enable Distributed Energy Resources Management (DERM), competing with AutoGrid, Kiwigrid and C3 IoT. SET Ventures leads the new €3M round and is joined by the existing investor Munich Venture Partners. Startups not only got to pitch to and network with potential investors at Ecosummit Berlin 2017, they also got some valuable lessons on how to do it right. Leonie Baneke from Eneco Smart Energy gets sent lots of startup pitch decks, asking her for capital. This is the second year in a row Eneco has sponsored Ecosummit and Baneke says, they were part of the event since the beginning of their corporate venturing activities to look for cool and challenging ideas to invest in. The Dutch have money to spend, allocating 10 to 30 million euros per year to invest in external startups, follow-on investments and internal startups. Ecosummit TV: Ecosummit Berlin 2017 was our best event ever. 275 participants came to the Radialsystem to be part of Europe’s leading conference for smart green startups, investors and corporates. Our flagship event was supported by 30 sponsors and presented 95 speakers including 61 startups on stage. During the last few days we published all Berlin videos on Ecosummit TV and linked them next to each speaker in the agenda. A highlight of Ecosummit Berlin is the Ecosummit Award that brings fame and fortune to 6 new startups every year. 37 judges screened 34 nominees from 10 countries and voted online before the conference. And the 3 winners in the late stage startup category (> €2M revenues 2016) are: Gold (€1.5K prize money) for Restore from Belgium, Silver (€1K) for Visedo from Finland and Bronze (€500) for Greenergetic from Germany. And the 3 winners in the early stage startup category (< €2M revenues 2016) are: Gold (€1.5K) for Freshland from Denmark, Silver (€1K) for Hydrogenious from Germany and Bronze (€500) for Cleverciti from Germany. Congratulations to the founders for convincing the Ecosummit judges of your growth potential. And thanks so much for joining us, it was a real pleasure hosting you. 2 European corporate VCs announce their new investments today at Ecosummit Berlin 2017 proving that German smart green startups are innovative, competitive and very attractive investment opportunities. Inven Capital, funded by the Czech utility CEZ, met Cloud&Heat one year ago at Ecosummit and today invests in the Dresden-based early stage startup. Founded in 2011, Cloud&Heat provides energy efficient data centres that use server heat for hot water and heating in commercial buildings, reducing operating costs of data centres by 50%. The Dutch utility Eneco invests in Next Kraftwerke and acquires a large minority interest of 34%. Founded in 2009, the Cologne-based late stage startup operates a large Virtual Power Plant (VPP) across 8 countries in Europe with 2.8 GW of renewable energy capacity under management. After acquiring 50% of Lichtblick in January 2017, this is the second major smart green energy investment of Eneco in Germany. ONZO’s cloud-based analytics are powering into domestic energy markets. Emerging from the buzzing London tech scene in 2007, the company first focused on hardware, creating a clip-on power meter with wireless display. However, in 2012 the rapid roll out of smart meters led them to sell off the hardware business to Scottish utility SSE. Steven Daniels, one of the private equity investors, took the reins as CEO and the company re-started as a pure energy analytics company floating in the cloud. To get out of fossil fuels and enable a global energy transition all industries must be electrified and powered by renewable energy. Founded in 2009 in Lappeenranta, the high-tech epicentre of Finland’s Far East, Visedo is an early mover when it comes to electrifying marine vessels such as ferryboats and barges and heavy duty vehicles and machines used in mining, construction and transport. Visedo makes customised electric propulsion systems to convert vessels and vehicles to fully electric or hybrid machines with zero or low emissions. After raising a €13.5M Series C in December 2016 from Emerald, VNT Management, Sinituote, Tesi, Green Campus Innovations and others, Visedo is now the rising star of the Finnish cleantech scene enjoying sustainable traction. Since 2010, we have established Ecosummit as Europe’s leading smart green innovation and impact conference for startups, corporates and investors active in energy, mobility, buildings, cities, materials and food. In 2017, we organise 4 conferences in Berlin, Amsterdam, Stockholm and London presenting over 150 startups. 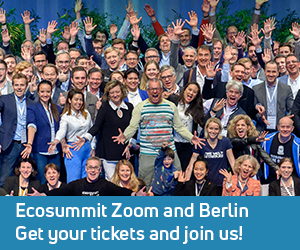 Our flagship event Ecosummit Berlin 2017 takes place on 9-10 May 2017 at the Radialsystem, unites over 300 participants and is supported by an innovative group of sponsors. Now we call the best smart green startups in Europe to get promoted by pitching at ECO17 Berlin, applying for ECO17 Award and getting featured in our new startup list Ecosummit Europe 100. Past Ecosummit Award winners include Sonnen (Series D), Heliatek (Series D), Tado (€20M from Inven) and Kiwigrid (Series C). Kiwigrid raises a double-digit million Euro Series C from Aqton, Stefan Quandt’s family office that also invested in Heliatek’s Series D, Innogy and LG Electronics to build a global energy IoT platform. The Dresden-based smart green startup won the ECO16 Gold Award in the late stage category and has got over 105 employees. High-Tech Gründerfonds, Germany’s largest seed investor with 80% public money, and Innogy Venture Capital, the old corporate VC fund of Innogy that is in its divestment period, sold their shares completely and celebrate a financial exit with positive returns. Corporates play an important role for startups and VCs and often combine direct and fund investments to get access to external innovation. After a 2-year fundraising journey that even included the bankruptcy of one LP, the Dutch VC Icos Capital announces today the first closing of its third fund Icos Capital Fund III at €50M. The fund investors comprise the City of Rotterdam and the corporates Akzo Nobel from the Netherlands, Bühler from Switzerland and Wuppermann from Germany. Peter van Gelderen, one of the 3 GPs managing the fund, describes their investment philosophy as collaborative corporate venturing and emphasizes the close cooperation with the 3 multinationals that don’t have inhouse corporate VC units. According to Peter, new corporate relationships take a lot of time and many meetings until the board makes an LP commitment in your VC fund. On-demand urban air transportation is the next big thing according to Daniel Wiegand, CEO and Co-Founder of Lilium. The German aviation startup develops an electric VTOL (vertical take-off and landing) aircraft called Lilium jet since 2015. Today, Atomico invests €10M Series A and Niklas Zennström joins the board. Daniel and his team of 35 employees have the vision to make urban aviation electric, silent and available for everyone with the help of airtaxis and other aviation services. Uber also shares the vision that urban mobility should go vertical and is already working on matching pilots and passengers that want to bypass street-level congestion and traffic jams. In October 2016, the Californian mobility giant unveiled Uber Elevate in a 97-page must-read whitepaper. It would be no surprise if they soon co-invested in Lilium as übercool VTOL jets are the missing link to launch Uber in the air. Ubiquitous smart meters are a key infrastructure component for the smart green utilities of the future because they generate a lot of valuable data and enable new energy services and dynamic pricing. In fact, it is a surprise that smart meter rollouts happen rather slowly in most countries due to slow regulators and hesitant utilities that are not yet ready to make substantial upfront investments in millions of smart meters that may bring more economic benefits to consumers than to the utilities themselves. Luckily, the Nordic countries and their resident startups have a headstart. Today, Düsseldorf-based corporate VC Statkraft Ventures leads the $5M Series A in Greenbird teaming up with London-based ETF Partners who were on the top of their potential co-investor list. The Norwegian energy IoT startup is Statkraft’s second investment this year after DEPsys from Switzerland in June. The Internet of Things, Industry 4.0 and the insurance industry are coming together. Berlin-based IoT startup Relayr raises $23M (€20.7M) Series B from Munich RE/HSB Ventures, KPCB and Munich Venture Partners. It turns out that the industrial insurance company Hartford Steam Boiler (HSB), since 2009 part of Munich RE, has started to embrace IoT a while ago to make their life easier and insurance business smarter. In a nutshell, HSB insures manufacturing companies against the risk of equipment breakdown and other reasons for suboptimal factory performance. By making the machines smart and connecting them to the Relayr cloud, their health status can be monitored online. If the automated machine data analysis identifies any problems, the malfunctioning machines can be repaired or replaced before it is too late and the production line has to be put on hold without knowing why.